One of the many reasons people have Glidecoat applied to their boat is to overall improve the gloss and shine. Obviously, there are numerous other reasons, from the ability to eliminate the use of wax, adding the hydrophobic capability so acid rain, salt, bird dropping, fish blood, leaf stains don’t mark the surface, to locking in the color and protecting the surface from UV for up to 18-24 months. Measuring that gloss and shine requires a Gloss Meter. Gloss is determined by projecting a beam of light at a fixed intensity and angle onto a surface and measuring the amount of reflected light at an equal but opposite angle. All gloss levels can be measured using the standard measurement angle of 60°. This 60 degree angle is used as the reference angle for all products including Gelcoat and painted surfaces. There are instruments that measure up to 3 different angles including 20°, 60°, or 85°. So why choose some other another angle? For extreme gloss, one obtains better measurements with the complimentary angles of 85° or 20° often used for low and high gloss levels respectively. For Glidecoat’s purposes though we use the industry standard at 60°. It has been shown that the gloss level of a product has as much psychological impact on a consumer as its color. Surface quality can often be assessed by measuring gloss. For example, poorly cured paints or coatings can exhibit unusual gloss levels and can lead to chipping and flaking at a later stage. Monitoring gloss means that problems such as these can be highlighted early, avoiding costs of re-coating. Glidecoat monitors gloss during the lifetime of its coatings because as the coating ages its gloss level drops. When it reaches a preset level, the structure is re-coated ensuring that a maximum lifespan is achieved from the coating without the risk of impacting the surface it protects. Prior to preparing a boat for our coating, we suggest that there be a minimum of 8 Gloss Meter readings taken on the hull and 8 topside. Obviously, this depends on the size of the boat, but you need to be consistent in the location of the readings and take them before any preparation and at each stage during the process – compounding, polishing and finally coating. When measuring the gloss and shine after coating we suggest you do 2 sets of readings. The first about an hour after coating, when the surface is dry to touch and the second 24 hours later, when the coating has fully cured. It is common to see a 2% increase in the numbers once cured. 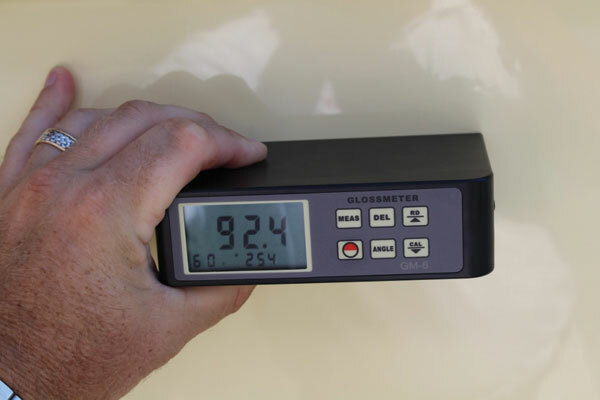 For older boats the initial readings can range from 10-20 GU on a heavily oxidized surface and to 80-85 GU’s on new gelcoat or painted surface. With a properly prepared surface and 2 coats of Glidecoat Top Coating readings should exceed 90 up to 97 GU’s. By monitoring the boats gloss readings over time, you can monitor the effectiveness of the coating and after 12-18 months, if the readings in the same location have reduced by 20%, you should re-apply. There are a wide variety of Gloss Meters on the market. Glidecoat sells one for $195.00, which is a competitive price for a 60 degree meter.